By day, Ted Bigornia is a commercial closer and escrow officer for a large title insurance company. But by Nightingale showtime hours, he is charismatic and hilarious in his role as Bing Wen, and pulls off the Herculean task of leading two of the heftiest numbers in the show. He has also worked as a pianist and music director for theatre productions. Ted shares about his path to and experiences on the stage, as well as what it's like to play the Emperor’s Lord-in-Waiting and the Palace Aesthetician. MIN: Describe your performance background. How did you get involved with theatre? 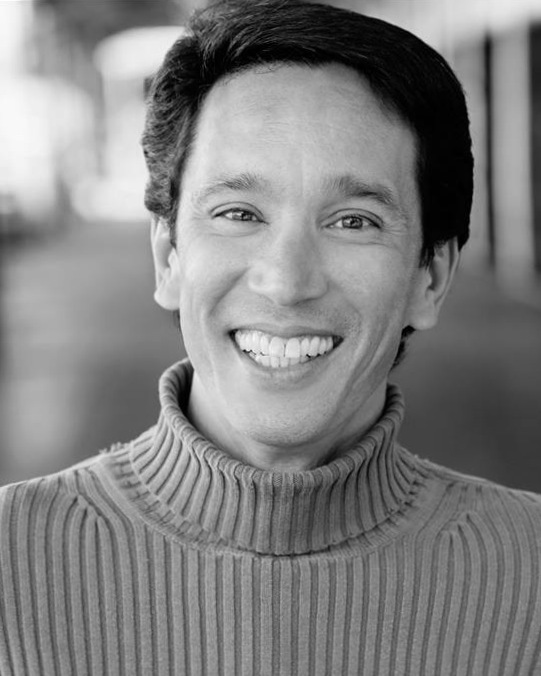 TED: I first became involved in theatre as a piano accompanist for a children’s theatre company in Vallejo during my senior year in high school. Around the same time, I was cast in the ensemble of my high school’s production of Oklahoma!, which was my first time on stage. I remained with the children’s theatre (which also incorporated adult students as “guest” artists) as both accompanist and performer – primarily in the ensemble or in character roles, working on productions in Vallejo, Napa, Sacramento and Fairfield, for three or four years. That was my start. I enjoyed it so much, I’ve been doing it off-and-on ever since. Lately, I have been exploring opportunities to work on the acting side of it more and more, having taken roles in non-musical plays as well. M: You have also worked as a music director for theatre productions. What do you enjoy about working as a music director? T: I really enjoy working with singers of various experience levels, and helping to bring out their best. I also particularly enjoy working with chorus/ensemble sections. This involves a creativity in part breakdowns and dynamics and tempo variety, and is rewarding every time, both in terms of entertainment value of whatever piece I’m working on, as well as in terms of pride of the singers. I LOVE to see singers feel great pride in their accomplishments, and encourage it. On the instrumental side of things, the challenge is always getting the best sound possible out of a very small combo, deciding what instruments to use given budgetary and availability constraints; this part of it can be stressful, but also very rewarding. M: Are there any insights you've gained from working as a music director that informs your work as an actor? T: Yes – very often, I learn just as much from the singers I work with as a musical director as vice versa. You get an objective perspective on the process, and I have a better understanding of why musical directors I’ve worked with will experiment with part assignments, word pronunciations, dynamics and the like. When you are singing, whether solo, or with a group, you can NOT really get the full perspective of the effects of what you are doing. M: What has working on The Song of the Nightingale been like for you? T: This has been the experience of a life-time. From the staged reading three years ago, through this current run, I have enjoyed taking on material that is new, that has no existing history of production performance by anyone else. Kind of forces you to bring your own interpretation to everything. The material is wonderful, the message is positive and simply “feel-good” kind of stuff, which seems rare in newer shows these days. Also, it truly isn’t often that you get to work with a group that has this much accumulated talent. Every single person involved – from the production staff, cast and crew – brings so much value to this production that, altogether, creates a phenomenal experience for me. M: Describe a little bit about your approach to the character of Bing Wen. 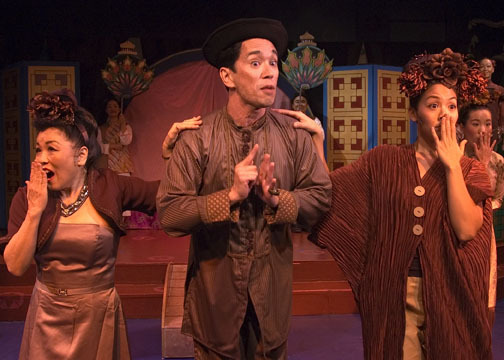 In older iteration of the script, Madam Wu (Alexis Wong) and Bing Wen (Ted Bigornia) were an item. T: Three years ago, during rehearsals for the staged reading, I remember a candid conversation we had between some of the cast and yourself, wherein you mentioned that you had earlier thought about creating some kind of relationship between Liu Bing [now named Bing Wen] and Madame Wu – and you got the immediate response from everyone present that it was a bad idea. Someone went so far as to suggest that Liu Bing HAS to be “fabulous.” That conversation led me to feel free to try a more flamboyant direction with him. Cut to the current production and at the first read-through, you explained how this piece was born of your love of Disney films, and that these characters are cartoons and over the top, which led me to decide to take the flamboyance perhaps even a little further and make it rather affected. Is it realistic? Probably not. I do try to bring an over-the-top theatricality to Bing Wen. M: How is the character similar to you? T: Bing Wen and I both share a certain pride in our craft, I think. He is very proud of his designs, and it is important to him what the court members think (this is apparent his great fear of having to present the ugly Nightingale to the court). I am the same way with performance. When things go well, and when what I do works, then I have great pride in what I do. But I share the same fear of making poor choices and turning in a performance that does not work. Yes I do have an ego and fully admit it, and we both share a fear of damage to it. M: How are you different from Bing Wen? T: I’m not nearly as affectedly flamboyant as what I try to convey in Bing Wen. Outside of yucking it up at a theatre rehearsal, I’m really not that “fabulous.” When I do “turn it on” it’s just that; I do that as a clown. I also don’t mind being funny, even at my own expense. I don’t think Bing Wen would ever be comfortable being laughed at. It would hurt him, I think, if he believed anyone were making fun of him. Bing Wen’s flamboyance is a part of him, and he may not even really consider himself flamboyant, it’s just the way his is. M: It is actually moving to me that you consider Bing Wen’s feelings. Even with the over-the-top affect, I believe you have brought out an emotional depth to a character that could have been played very two-dimensionally. So, thank you! Anything else you'd like to share? T: I can’t think of anything further really to say, except to thank you very much for this opportunity to work on this with you. I know you really didn’t know me when I auditioned for this three years ago, and I think it must have been a bit of a gamble for you to go with me for this role. But I’m glad you went with it, and continued to keep me a part of it for the purposes of the current production. Ted, with fellow actors (from left to right) Miyoko Sakatani, Isabel Anne To, Christopher Juan, Lindsay Hirata and Ji-Yun Kim. I would like to see your show go even further. I’d love to be able to see your show, fully backed and fully professional, perhaps in NY or National Tour, perhaps after it has garnered a Tony or two, and be able to say that I was a part of that back when…back when…! M: I’m very thankful to have you in the cast as well, Ted! Thanks for your well-wishes. Posted on November 8, 2013 by Min Kahng and filed under Creative, Nightingale, Performing Arts, Musical Theater and tagged Ted Bigornia interview The Song of the Nightingale.